Geppetto and Pinocchio. But, who’s who? When discussing documentary films, it’s common to hear of subjects being classified as ‘extraordinary’. A perplexingly loaded word, it’s overuse has lead to it meaning virtually nothing, like those idiots who would consider a sit-down dinner ‘EPIC’ when they really mean ‘rather nice’. It’s a shame, because when you finally do hear, read or watch of a a stranger than fiction tale, that is truly remarkable, it’s hard to be taken seriously. At last, Marwencol is a documentary of truly extraordinary proportions. Beaten to within an inch of his life by a bunch of thugs outside an upstate NY bar, 38-year-old Mark Hogencamp suffered from extensive brain damage; with much of his memory lost and, temporarily his ability to move. 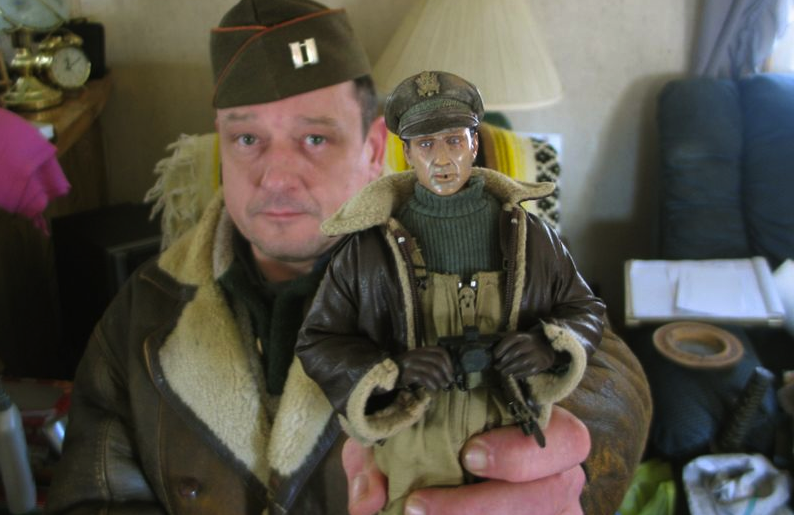 Determined to create a better world than the cruel one he lives in — and refused the rehabilitative care he desperately needed — the former alcoholic conceives Marwencol, an imaginary World War II Belgium town populated by G.I. Joe figures and Barbie Dolls. It is here where his doll-sized alter ego can reign free and unafraid amongst his plastic, 1/6th-scale friends, all of which are based or influenced on Mark’s real-life friends, neighbours, and enemies. The town itself is a meticulous reproduction, slavishly created with minute detail and verisimilitude. Whilst playing in this toy town, Mark makes an indexical account of his own soap-opera, developing thousands of photographs – which are astonishingly lifelike – as a means of catharsis and an instinctive therapy for the chain-smoking hermit, completely aware of the artistic quality of his many creations. Debutant director Jeff Malmberg’s untidy presentation is only part of the charm of this stunningly empathetic documentary. Rather than focus on Hogencamp’s dramatic recovery, tribulations or attempting to reshape his forgotten past, Malmberg instead puts the focus squarely on the here and now, patiently developing a three-dimensional episode of this fascinatingly enigmatic man. Gently coaxing Hogencamp to trust him, Malmberg establishes a painful intimacy that never feels exploitative or mawkish. Patiently and with great respect, he reveals the unusual facts of Hogencamp’s personal life and the reason for the attack.Mark is a fascinating enigma. He speaks hesitantly, as if the words are unfamiliar in his mouth. He segues easily between discussions of the real world and of Marwencol, and it’s not always clear that the two are different realities for him. He does have a sense of the outside world’s values and opinions, as he’s sometimes obviously embarrassed to reveal certain details about himself or his town; equally, he lets drop surprisingly revealing statements without batting an eyelid. A little clunky in places and losing steam by its close, Marwencol is not just an engaging and unsettling examination of an “outsider artist”, but a depiction of societal isolation more generally. An unforgettably touching examination of a man who forgot who he was — then found a path toward becoming uniquely complete. Extraordinary indeed. This entry was posted in ★★★★☆ (4) and tagged documentary, Jeff Malmberg, Mark Hogencamp, Marwencol, New York, Outsider Art. Bookmark the permalink.